Hello loves! 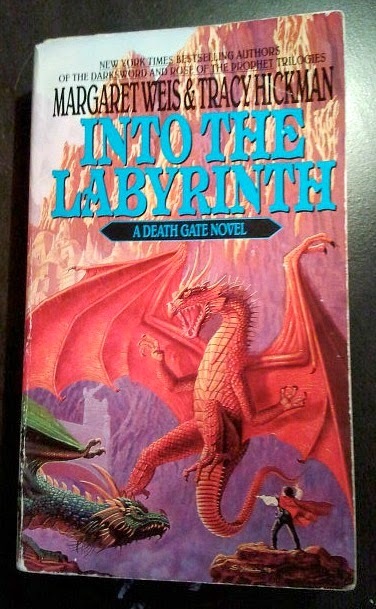 Today I have a book review for you: “Into The Labyrinth” by Margaret Weis and Tracy Hickman (1993). I picked up this book from my local Chapters without realizing it was the 6th book in a 7 book series (the Death Gate Series)! However the books are written in a “stand alone” manner so the reader can still understand the story without reading the books in chronological order (luckily for me). The reader does have to read all the books to discover the full story, however. This book ends on a cliff-hanger! I was never really into fantasy books, but this book has changed my opinion completely. It was such a fun read. There is never a dull moment; the story is filled with excitement and adventure. The series contains the usual fantasy races: humans, elves, and dwarves; plus two races unique to it, Patryns and Sartans (these races are superior, God-like. They refer to the lesser races as “mensch”). Sartans and Patryns possess magic which they control by using “runes” (magical symbols) drawn in the air and on the ground. They can also trace runes on buildings to protect them, or on weapons to enhance them. Patryns also tattoo the runes onto their bodies (sigla): these glow to warn them of danger. Here is a brief context overview (keeping in mind I only read the 6th book! ): The Sartan and Patryns were at war at the beginning of time. The Sartan “sundered the world” in an attempt to end this conflict and separated it into four worlds according to the four elemental elements: Chelestra, a world of water; Arianus, a world of air; Pryan, the world of fire; and Abbarach, the world of stone. The Labyrinth was also created, meant to serve as a prison designed to correct the Patryns. Xar: Also called the Lord of the Nexus. Xar is a powerful Patryn who escaped the Labyrinth and saved other Patryns. However the bulk of the Patryn race still remain in the Labyrinth. He wishes to rule over the mensch on all the other worlds and has an elaborate plan to create armies of “lazars” (people (could be of any race) brought back to life before the soul has had time to leave the body completely). He must locate the seventh gate in order to accomplish this. Sang-Drax: A dragon snake and counsellor of Xar. Dragon snakes are very powerful and evil creatures which can take on any form, but their true from are giant, poisonous, toothless serpents. Marit: She is another Patryn who escaped the Labyrinth through her Lord Xar’s help. She is faithful to Xar and wishes to help him in his plan to “take over the worlds”. Haplo: Also a Patryn and servant of Xar, he is considered a traitor because he has not followed Xar’s plan to “stir up trouble in the other worlds so Xar can come “save” them and take over”. Haplo has an intuition that Xar is being led by evil forces (the dragon-snakes). Alfred: a heretical Sartan who was against the Sundering. He has great power and can bring people back from the dead and transform himself into a dragon. Hugh the Hand: a human assassin, whois condemned to eternal life by Alfred. Paithan: an elf trapped on Pryan, who is obsessed with the Star Chamber. Aleatha: Painthan’s sister, an elf who gets what she wants by using her beauty. However she is misunderstood and lonely. Rega: a human trapped on Pryan, in love with Paithan. Roland: Rega’s sister, in love with Aleatha. Drugar: a dwarf trapped on Pryan, who is the last of his kind (or so he thinks). Zifnab: A very powerful wizard. He is completely insane and provides comic relief to the reader! He is one of the heretical Sartans who were against the Sundering, and was cast into the Labyrinth as a punishment. He was the first person ever to escape. The book starts out in Abbarach. Xar is trying to discover the location of Sartans so he kill them and raise an army of lazar. Xar learns that Haplo has betrayed him and sends Marit to kill him. Marit leaves Abbarach and searches for Haplo on Arianus. Hugh the Hand has also been sent out to kill Haplo by the Kenkari (powerful elf leaders). Hugh is armed with the Cursed Blade. Hugh nearly kills Haplo but ends up dead himself (not for long, since he is cursed with eternal life). Eventually Marit finds both of them and attempts to kill Haplo. However, the Cursed Blade is “programmed” to kill any Patryn (it was created with Sartan magic) and both are in danger. Haplo attempts to stop the blade by landing Marit’s ship on Chelestra, the world of water (the water nulls Sartan and Patryn magic). This turns out to be a horrible plan as the Blade summons a dragon-snake and the ship is destroyed! When all hope seems lost, Alfred saves them and brings them to the Vortex, a one way portal at the center of the Labyrinth. Meanwhile, on Pryan, Paithan, Aleatha, Drugar, Rega and Roland are constantly quarrelling over the dwindling food supplies. They are the only five people remaining in the Citadel, the only safe area in Pryan, which is covered in a vast jungle. This jungle inhabited by tytans, giant eyeless beasts who will trample them if they leave the Citadel. Paithan is fascinated with the Star Chamber, a room at the top of the Citadel containing an apparatus from which an extremely bright light sometimes shines. The tytans seem to be mesmerized by this light and are harmless when it is shinning. Xar and Sang-drax arrive on Pryan in hopes of finding the Seventh Gate. Xar plans on killing the mensch so he can use them to distract the tytans. Meanwhile Drugar discovers the role of the tytans: they control the Star Chamber. Zifnab and his dragon manage to save the mensch from Xar, but Drugar unfortunately dies. Aleatha allows the tytans to enter the Citadel, and the other mensch hiding in the jungle can now return without fear. Everything then seems to end well on Pryan. Xar steals a Sartan amulet from Aleatha and uses it to enter a Sartan ship deep within the jungle, which he uses to return to the Labyrinth. Alfred, Marit, Haplo and Hugh set off to travel through the Labyrinth to hopefully reach the Nexus to escape. Travelling through the Labyrinth is extremely dangerous but they are left with no other option. Eventually they reach Abri, a strong city built by Sartans and Patryns who overlooked eachother’s differences and worked together. Marit overhears Sang-Drax and three other dragon-snakes who have been posing as Patryns reveal their plans to attack Abri and seal the Final Gates, preventing the Patryns from escaping forever. Haplo had been right! Sang-Drax was using Xar all along for his own motives. Marit warns Vasu, leader of Abri and by working together, the city manages to defeat the armies of the Labyrinth. Alfred turns into a dragon and is a great help in the battle. However, Xar arrives and kidnaps Haplo who is very weak from fighting. And although Sang-Drax has been defeated, there are other dragon-snakes who are on their way to the Final Gate… Marit and Hugh leave Abri to find Alfred (who is missing) because he is their only hope to prevent the Patryn’s destruction. As you can see this series is quite complicated with the numerous characters and many worlds but once you get into it, it’s quite addictive! I will definitely be reading the other books in the series! !